The Physics Menu is an advanced feature, which gives you control on the physics and materials of your objects. 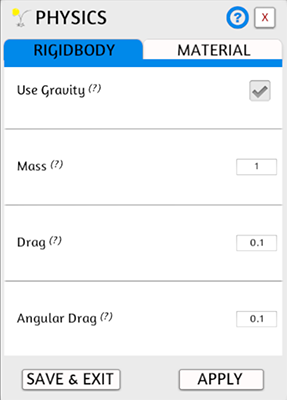 To access it, right click on an object and choose the Physics option. There are two different tabs where you can control different things with your object, Rigidbody and Material. With Rigidbody you can make your objects move in a realistic way by adjusting various controls. ◘ Use Gravity: If this box is enabled, the object is now affected by gravity. ◘ Mass: This is the mass of the object (arbitrary units). Be sure not to make the masses more or less than 100 times that of other Rigidbodies. Making an object have greater Mass than another does not make it fall faster in free fall. Use Drag for that. ◘ Drag: How much air resistance affects the object when moving from forces. 0 means no air resistance, and infinity makes the object stop moving immediately. A low Drag value makes an object seem heavy. A high one makes it seem light. Typical values for Drag are between .001 (solid block of metal) and 10 (feather). ◘ Angular Drag: How much air resistance affects the object when rotating from torque. 0 means no air resistance. Note that you cannot make the object stop rotating just by setting its Angular Drag to infinity. The Physics Material is used to adjust friction and bouncing effects of colliding objects. Friction comes in two forms, dynamic and static. Static friction is used when the object is lying still. It will prevent the object from starting to move. If a large enough force is applied to the object it will start moving. At this point Dynamic Friction will come into play. Dynamic Friction will now attempt to slow down the object while in contact with another. ◘ Static Friction: The friction used when an object is laying still on a surface. Usually a value from 0 to 1. A value of zero feels like ice, a value of 1 will make it very hard to get the object moving. ◘ Dynamic Friction: The friction used when already moving. Usually a value from 0 to 1. A value of zero feels like ice, a value of 1 will make it come to rest very quickly unless a lot of force or gravity pushes the object. ◘ Bounciness: How bouncy is the surface? A value of 0 will not bounce. A value of 1 will bounce without any loss of energy.